It was a beautiful 4/20 morning when our day started with breakfast at the hotel in Phobjika. Phobjika is known to be home to the Black neck cranes during the winter when they migrate from Tibet. The valley was finally visible in the morning haze. It was raining when we got on the bus to go to Gangtey Goempa, a temple with a thousand Guru Rinpoche statues; one grand, that’s a lot of Guru Rinpoches! You can make your wishes here: _____________. 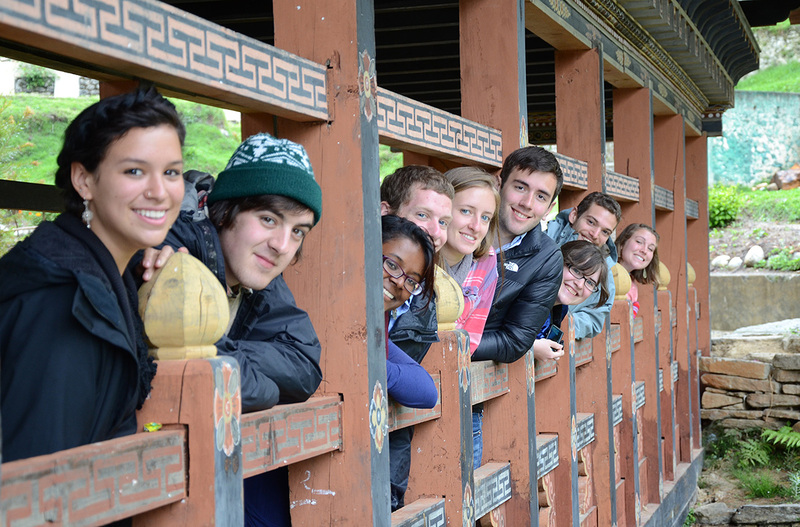 We got back on the bus and headed for the huge choeten (stupa), Chendebji. Chendebji was modeled after a turnip that a pilgrim had carved in the shape of Bauddhanath, the most important chorten for Tibetans in Nepal. We circumambulated in the rain and happened upon a wishing stone. We put our heads to the stone and wished for the benefit of all sentient beings (except for Ana, who wished for ice cream). At lunch Ana’s wish was sort of granted when we got yoghurt and fruit for dessert, kadrinche bumo! From lunch we had a beautiful view of our next destination, Trongsa Dzong, and it was back on the road. When we got there we were greeted by a flood of monkeys from the woods. Our arrival auspiciously coincided with the monks’ annual ritual for the death anniversary of Shabdrung. We had the opportunity to sit among the monks as they chanted and played drums, horns, bells, and conch. The instrument that stood out to us most, however, was the trumpet made from a human thighbone, the bigger the thigh the better! We tossed rice when they did for auspiciousness and received blessed ara, Bhutanese rice wine, from a human skull. We also received a blessed fruit. 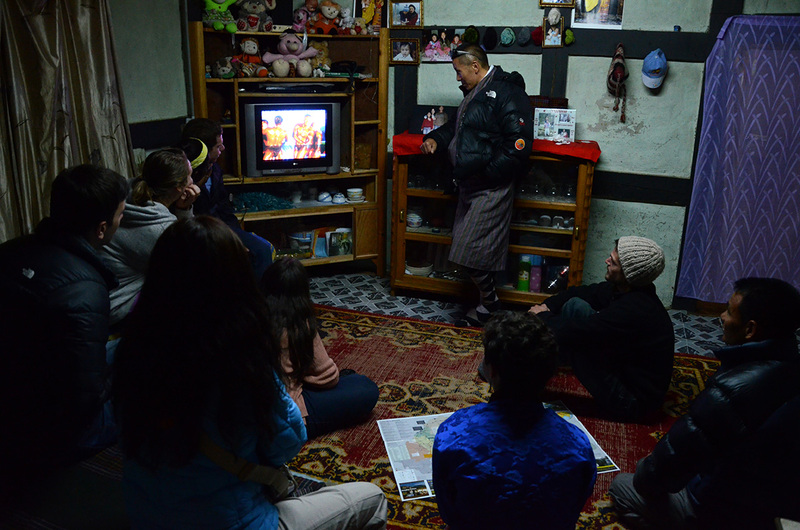 Because of our donation, the lama gave us blessed granules, each of which is a norbu, or jewel. They are small, round pellets that may contain the cremated remains of lamas. Our contribution was compared to a drop in the sea, small but will never dry out. You dissolve the granules in hot water or tea and ingest to restore your body’s health, but only if you believe in its power. Then we came to our final stop of the day where we would rest our tired bodies. It was a Bhutanese farmhouse! We stayed in the altar room. 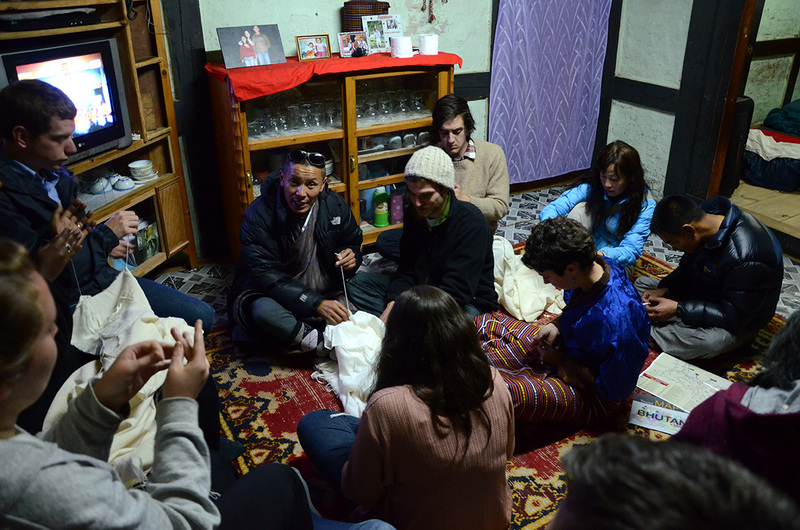 Every Bhutanese home has a room with a shrine with burning butter lamps for pujas, religious rituals. We were advised by Tsewang not to fart in this room. 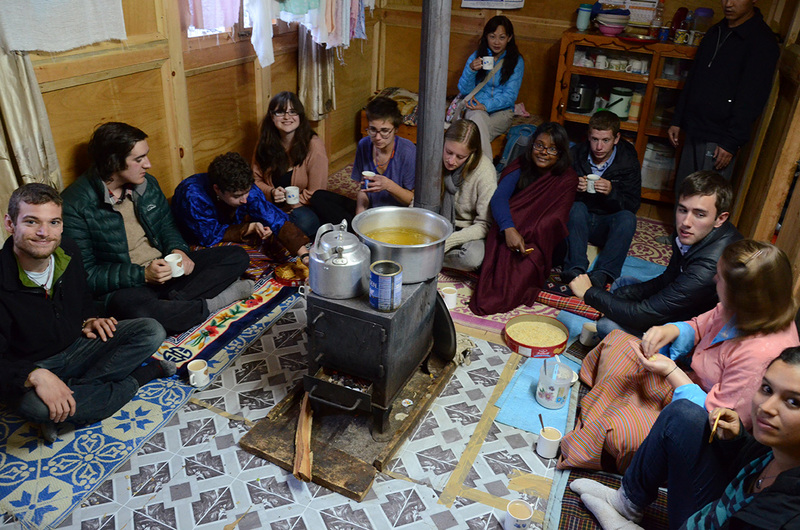 We gathered around the wood-burning stove (careful, its hot!) 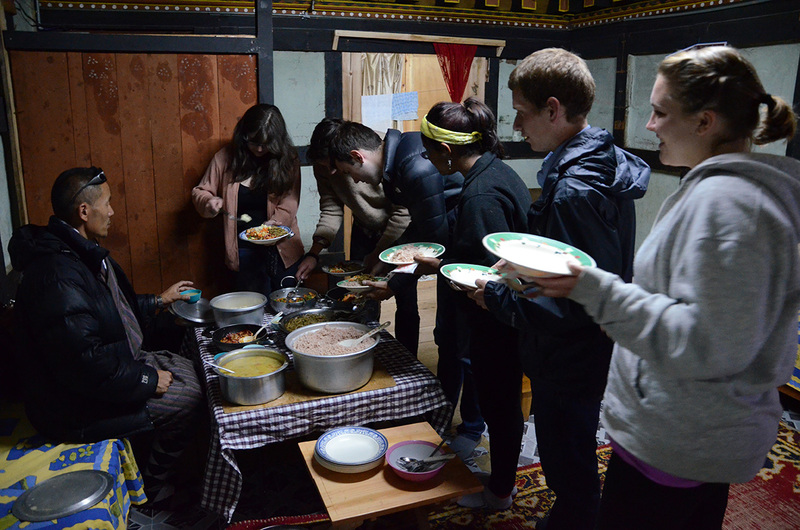 in the kitchen, the hub of the Bhutanese home, and were served ngaja (sweet tea) with zau (puffed rice). 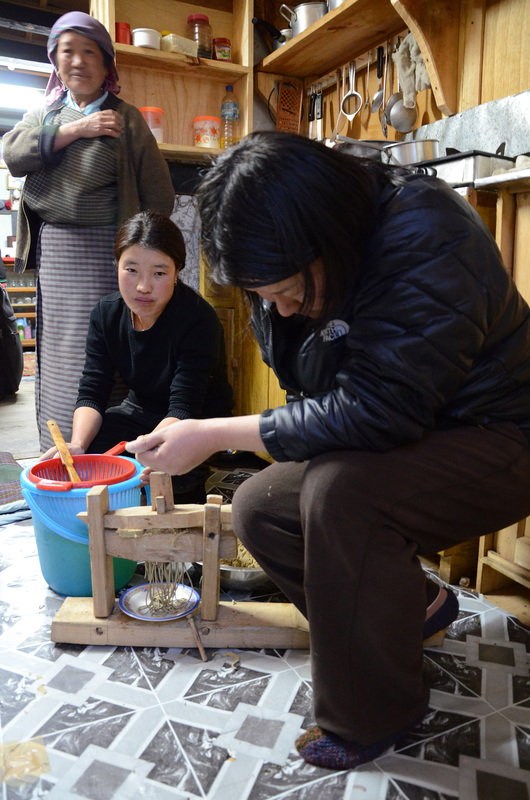 We watched as one of our hosts made puta (buckwheat noodles), pushing with all their weight on the wooden press from which the noodles slowly emerged. Those in the other room watched the second annual bodybuilding competition (looks like someone had an extra serving of rice)! A thighbone donation from these beefcakes would be greatly appreciated. The other women who were not making puta, were busy at work twisting the threads of our kabnes and rachus. We had brought them out to prepare them for the following day’s tsechu at Domkhar but the women quickly confiscated them and took over. In no time at all they twisted the threads into fringes, a task that would’ve taken us all night. That night we feasted, hard. We had kewa datsi (potato and cheese), ema datsi (chili and cheese/national dish), peas and paneer, to marp (red rice) and cauliflower and carrots. It was by far the best meal ever. We watched Mr. Beans and called it a night eager for tomorrow’s Domkhar Tsechu.